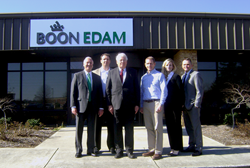 Boon Edam Inc., a global leader in security entrances and architectural revolving doors, was honored to receive a specially scheduled visit on Monday, February 1st by U.S. Congressman David E. Price, who represents the 4th District in North Carolina. The Congressman was then given a tour of the 275,000 sq. ft. factory and the product showroom to see firsthand how the products are manufactured and how they operate to stop tailgating. Rep. Price noted that he had seen several types of security entrance products in federal buildings in Washington D.C. Boon Edam’s security entrances are currently deployed in many federal and military facilities around the USA, and many are equipped with two-factor or multi-factor authentication systems to ensure the identity of the user is verified prior to entry.